I appreciate your response. I was getting worried for a while. 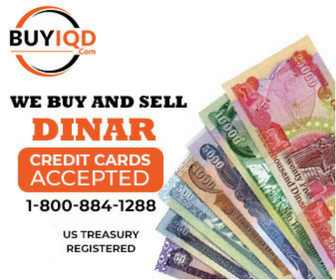 It would seem to me that if the loans came in the form of dollars, yuan or an EU currency - with the dinar so devalued, Iraq would be able to purchase and hire more as opposed to a higher valued dinar. Basically. it would make sense for them to leave the dinar at it's current value for in-country infrastructure projects - get more bang for the buck. I do hope I am wrong, because if this is their train of thought then it might be a long time until an RV occurs. Thoughts?? Problem is - with all that cash out of the country - shall we expect the Iraqi govt to just say - we are going to issue a different currency in order not to have such large losses. Now if that happens - where does that leave all of us - with the currency we bought in good faith? Bruce Believes the 22nd is Our Date. No idea who Bruce is - but he is consistent - wrong all the time. He needs to find a hobby or something - and stop with speculating with dates. Bruce Believes 1st Of July Could Be Very Interesting. I do wish people would stop saying/ writing - "any minute" or "based on my intel source"- the universe wide rv will happen by X date. It's a waste of time reading them - only to see such proclamations that never come close to being accurate. If this ever revalues - it will be a spur of the moment kind of thing as others have said. At this point - I skip by articles by most of these people since they apparently write just to be noticed - which is very sad. From what I can tell - we are neither closer nor farther away from an rv than we were months ago. I just wish some country would say enough and rv independently. What are they waiting for if this is their intent to rv at all. Waiting just cuts them money and misery for their citizens. There is no need or requirement for everyone to go at the same time - so one of them needs to jump out there and be independent thinkers. The longer this drags on - the less likely any country will rv - leaving us with some colorful bird cage lining. Makes one wonder if the Iraqi's are even capable of self government. Sort of applies to many Middle eastern govts. We are watching an exercise in graft and out and out thievery. Believe it is time for the citizens to storm the GZ and route the whole bunch. It would be nice to see the RV sometime in the next 5 years.